This on the surface may appear to be yet another celebrity ‘cash-in’ with the promise of a ‘warts and all’ autobiography. The sceptic in me thought ‘Ah, he’s back on the radio as a presenter on Radio 2 now its time for the inevitable autobiography.’ Wrong! 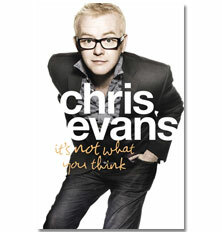 This is in fact an interesting and revealing insight into all things Chris Evans by the man himself. I remember back in the 1990s Evan’s being the presenter of such television shows as ‘The Big Breakfast’, ‘Don’t Forget Your Toothbrush’ and ‘TFI Friday.’ He also enjoyed a successful (attracting 7.5 million listeners) and controversial term hosting the breakfast show on Radio 1. His departure from Radio 1 with evidence of his private life overlapping his professional life and with the lines increasingly becoming blurred was well documented by the tabloids at the time. This book reveals a lot more than that and my trepidation was soon replaced with enthusiasm as I read on. The early years of Evan’s life see him enjoying a typical working class upbringing in a loving family home in Warrington. Tragically his father died when Evans was only thirteen, an event many attribute to his enthusiasm and ‘carpe diem’ attitude and persona. This early brush with mortality seemed to act as a catalyst for the young Evans. Anyone that knows him in a professional or personal capacity, or has listened or watched him presenting will know that he has charisma and energy in abundance. It was enjoyable learning of the pre - fame Evans, the lad who enjoys his first true love, works on a newspaper round and in a newsagents as well as in a plethora of other various jobs. His early passion for the radio led him to Manchester where he managed to meet an unlikely personal idol and start working behind the scenes for Piccadilly Radio. Learning everything from production, writing, editing and presenting a radio show the young Evans developed his own unique style. It is clear that he was bustling with ideas and ambition and before long he moved to London where the Evans we know today emerged. It was fascinating and riveting learning how he managed to launch his own production company Ginger Productions, acquire the Virgin Group Radio Station from entrepreneur Richard Branson for £87 million, before eventually selling the Ginger Media Group and Virgin Radio for £225 million a few years later. Not bad for a working class lad from Cheshire! Evans talks frankly about his colleagues, his relationships and his ambitions. This book gets behind the funny, cheerful, scattergun delivery of Evans the presenter and shows us an articulate, intelligent, driven and ambitious man with undoubted creativity and a wide variety of interests. My very basic impression of him I discovered was totally at odds with the ‘real’ individual. This book is engrossing and involving. I could not help but warm to him. Here he is witty and forthright and displays humility putting his hand up and pleading ‘guilty’ of his past precious star behaviour and excesses. It seems he has done a lot of growing up under the media spotlight and has reached the perfect time to reflect on his life so far, revealing to us his take on events as they happened. It looks like he has (unsurprisingly) much more to say by the end of the book and it appears that a Volume 2 is in the making. For anyone interested in a career in broadcasting or any aspect of working in radio or television this is a must!